Since the publication of the Choosing Wisely recommendations two years ago, we have sought to evaluate the ANA ordering patterns within our local referral network, composed primarily of general practitioners. Additionally, we wanted to identify how often a positive ANA result triggered a rheumatology referral. Lastly, we assessed whether raising awareness of published recommendations would alter ANA ordering patterns within our community. We conducted a retrospective chart review of consecutive new referrals received using a convenience sampling method. We excluded referrals sent for a second opinion, repeat referrals or referrals for a specific procedure (e.g. joint injection). We determined from the information provided in the referral whether an ANA was indicated based on published Choosing Wisely criteria and BC recommendations (Table1). We also determined if the clinical question pertained specifically to a positive ANA, and thus, triggered the referral. Following our baseline data, we mailed an information pamphlet highlighting the published Choosing Wisely and BC recommendations regarding ANA testing to offices of general practitioners (GPs) in the surrounding community. We also conducted two in-house educational sessions for community GP’s and nurse practitioners covering the same information as the pamphlets. We subsequently repeated our baseline analysis on a second independent sample of referrals received approximately two months following our intervention. We reviewed 100 consecutive new referrals from October 2016 to March 2017. Forty-six per cent (46%) of referrals had an ANA measured. Of these, 81% did not meet the recommended indications for ANA testing. 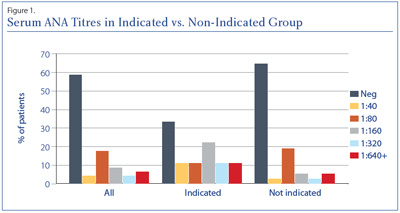 Of the ANA’s done without an indication, 59% were negative compared to only 33% of the indicated ANA’s (Figure 1). Twenty percent of referrals were requested primarily for interpretation of a positive ANA. Of these, 13 (65%) had an ANA test that was not indicated. Following our intervention, we reviewed 50 consecutive new patient referrals using the same parameters as our initial sample. We found no significant difference in frequency of ANA testing; however, a significant improvement in the proportion of ANA’s meeting indications for testing was noted (Table 2). There was no significant difference in the number of referrals for positive ANA, but again an overall trend towards improvement in adherence to recommended indications for ANA testing was observed. With respect to reducing unnecessary ANA ordering, we found that raising awareness regarding the Choosing Wisely recommendations produced a significant reduction in the proportion of inappropriate ANA testing among our referrals. Nonetheless, there was no reduction in the frequency of ANA’s ordered or the number of referrals for positive ANA. We suspect that this is most likely due to primary providers ensuring that they list an accepted indication within their referrals rather than ordering ANA less frequently. Thus, although further education for the use of ANA should be part of our strategy, a varied approach is likely required. Similar educational interventions have been successful to reduce the rate of unncessary ANA testing among rheumatologists.11 Other strategies, such as a laboratory algorithm for ANA testing, have also proven successful8 and should be considered. 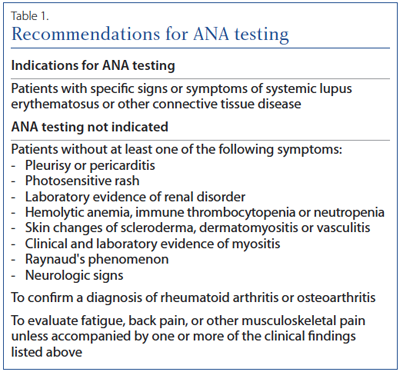 It is nonetheless clear that inappropriate ANA testing remains a common issue in rheumatology referrals and further research regarding both causes and effective intervention strategies is needed. Limitations of our study include potential for observer bias. As well, conclusions regarding the intervention effect are limited due to lack of controls and potential for Hawthorne effect. 1. Solomon D, Kavanaugh A, Schur P, Guidelines A. Evidence‐based guidelines for the use of immunologic tests: Antinuclear antibody testing. Arthritis Care Res 2002; 47(4):434–44. doi:10.1002/art.10561. 2. Wiik A, Cervera R, Haass M, et al. European attempts to set guidelines for improving diagnostics of autoimmune rheumatic isorders. Lupus 2006; 15(7):391–6. doi:10.1191/0961203306lu2322oa. 4. Chow, Thorne C, Bell, et al. Choosing Wisely: The Canadian Rheumatology Association’s List of 5 Items Physicians and Patients Should Question. The Journal of Rheumatology. 2015; 42(4):682–9. doi:10.3899/jrheum.141140. 5. Canadian Institute for Health Information (CIHI). National Health Expenditure Trends, 1975 to 2017. November 2017. 7. Ferrari R. Evaluation of the Canadian Rheumatology Association Choosing Wisely recommendation concerning anti-nuclear antibody (ANA) testing. Clin Rheumatol 2015; 34(9):1551–6. 9. Abeles A, Abeles M. The clinical utility of a positive antinuclear antibody test result. Am J Medicine 2013; 126(4):342–8. 10. Widdifield J, Bernatsky S, Thorne J, et al. Wait times to rheumatology care for patients with rheumatic diseases: a data linkage study of primary care electronic medical records and administrative data. CMAJ Open 2016; 4(2):E205–12. doi:10.9778/cmajo.20150116. 11. Lesuis N, Hulscher M, Piek E, et al. Choosing Wisely in Daily Practice: An intervention study on antinuclear antibody testing by rheumatologists. Arthrit Care Res 2016; 68(4):562–9.